The Solar and Heliospheric Observatory (SOHO) studies the internal structure of the Sun, its outer atmosphere and solar winds, and the stream of ionized gas that is constantly blowing outward through the Solar System. The 2nd of December 2017 marks the 22nd launch anniversary of the European Space Agency (ESA) – NASA Solar and Heliospheric Observatory (SOHO). 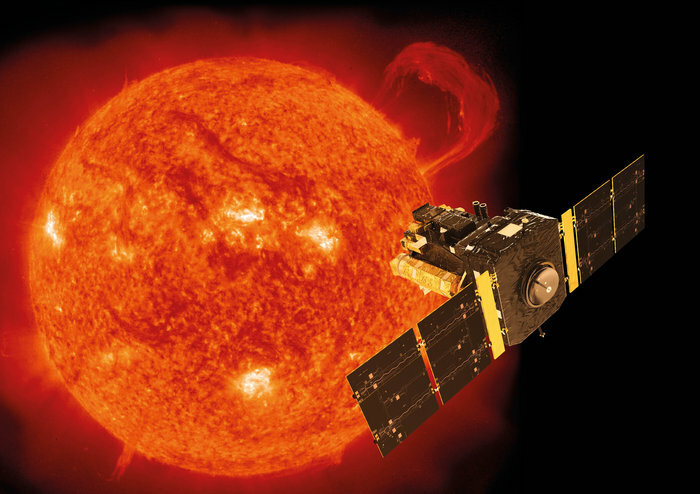 SOHO is the longest-lived heliophysics mission still operating and has provided a nearly continuous record of solar and heliospheric phenomena over a full 22-year magnetic cycle (two 11-year sunspot cycles). SOHO’s findings have been documented in over 5000 papers in the peer reviewed literature, authored by more than 4,000 scientists worldwide. SOHO provided the first ever images of structures and flows below the Sun’s surface and of activity on the far side of the Sun. 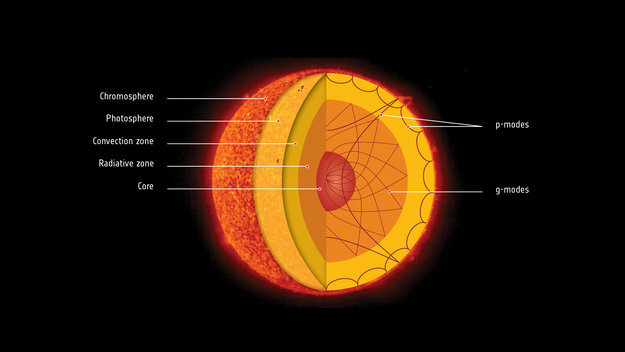 SOHO discovered sunquakes and eliminated uncertainties in the internal structure of the Sun as a possible explanation for the “neutrino problem” which concerned the large discrepancy between the high flux of solar neutrinos – particles which are now believed to possess mass and travel at almost the speed of light – predicted from the Sun’s luminosity and the much lower flux that is observed. The ultraviolet imagers and spectrometers on SOHO have revealed an extremely dynamic solar atmosphere where plasma flows play an important role and discovered dynamic solar phenomena such as coronal waves. SOHO measured the acceleration profiles of both the slow and fast solar wind and identified the source regions of the fast solar wind. SOHO revolutionized our understanding of solar-terrestrial relations and dramatically boosted space weather forecasting capabilities by providing, in a near-continuous stream, a comprehensive suite of images covering the dynamic atmosphere and extended corona. 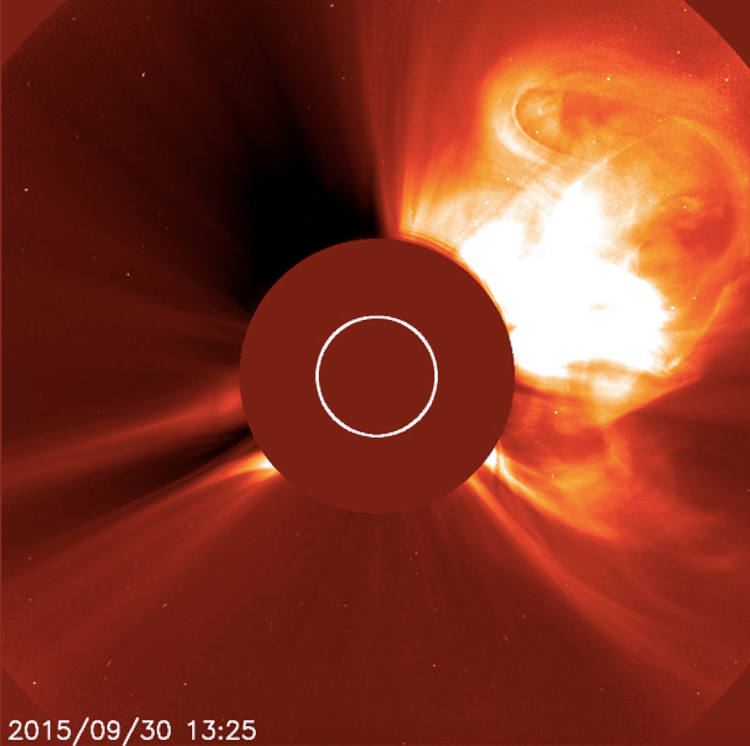 SOHO has measured and characterized over 28,000 coronal mass ejections (CMEs). CMEs are the most energetic eruptions on the Sun and the major driver of space weather. They are responsible for all of the largest solar energetic particle events in the heliosphere and are the primary cause of major geomagnetic storms. SOHO’s visible-light CME measurements are considered a critical part of the US National Space Weather Action Plan. For two solar activity cycles SOHO has measured the total solar irradiance (the “solar constant”) as well as variations in the extreme ultraviolet flux, both of which are important to understand the impact of solar variability on Earth’s climate. Besides watching the Sun, SOHO has become the most prolific discoverer of comets in astronomical history: as of late 2017, more than 3,400 comets have been found by SOHO, most of them by amateurs accessing SOHO real-time data via the Internet. In such complex areas of research as solar physics, progress is not limited to the work of a few people working by themselves. The scientific achievements of the SOHO mission result from a concerted, multi-disciplinary effort by a large, international community of solar scientists, including sound investments in space hardware, coupled with vigorous and well-coordinated scientific operations and interpretation efforts. Also, it is important to note that SOHO was not conceived as a “stand-alone” mission. Together with Cluster – a set of four identical spacecraft operated as a single experiment to explore in three dimensions the plasma and small-scale structure in the Earth’s plasma environment – SOHO formed the Solar-Terrestrial Science Programme (STSP), the first cornerstone of the European Space Agency’s long-term program called “Space Science Horizon 2000”, which was implemented in collaboration with NASA. STSP itself was part of an even larger international effort by NASA, ESA, and JAXA: The International Solar-Terrestrial Physics (ISTP) program, which included SOHO, Cluster, Geotail, Wind, and Polar, achieved an unprecedented understanding of the physics of solar-terrestrial relations by coordinated, simultaneous investigations of the Sun-Earth space environment over an extended period of time and, thus, can be considered the predecessor of NASA’s Living With a Star (LWS) program. While SOHO’s continued operation into the 2020s depends only on the longevity of its solar arrays, there is as yet no defined mission to succeed it in providing continuous, earth-Sun-line coronagraph observations. Prior to SOHO, our maximum warning time for extreme, earth-directed solar storms was measured in minutes; now it is 1 – 2 days. It would be prudent to preserve that advantage. See the full post here . Solar interior. No image credit. “The solar oscillations studied so far are all sound waves, but there should also be gravity waves in the Sun, with up-and-down, as well as horizontal motions like waves in the sea,” says Eric Fossat, lead author of the paper describing the result, published in Astronomy & Astrophysics. Eric and his colleagues used 16.5 years of data collected by SOHO’s dedicated ‘Global Oscillations at Low Frequencies’ (GOLF) instrument. By applying various analytical and statistical techniques, a regular imprint of the g-modes on the p-modes was revealed. In particular, they looked at a p-mode parameter that measures how long it takes for an acoustic wave to travel through the Sun and back to the surface again, which is known to be 4 hours 7 minutes. A series of modulations was detected in this p-mode parameter that could be interpreted as being due to the g-waves shaking the structure of the core. The signature of the imprinted g-waves suggests the core is rotating once every week, nearly four times faster than the observed surface and intermediate layers, which vary from 25 days at the equator to 35 days at the poles. The rapid rotation has various implications, for example: is there any evidence for a shear zone between the differently rotating layers? What do the periods of the g-waves tell us about the chemical composition of the core? What implication does this have on stellar evolution and the thermonuclear processes in the core? “Although the result raises many new questions, making an unambiguous detection of gravity waves in the solar core was the key aim of GOLF. It is certainly the biggest result of SOHO in the last decade, and one of SOHO’s all-time top discoveries,” says Bernhard Fleck, ESA’s SOHO project scientist. Our ever-changing sun continuously shoots solar material into space. The grandest such events are massive clouds that erupt from the sun, called coronal mass ejections, or CMEs. These solar storms often come first with some kind of warning — the bright flash of a flare, a burst of heat or a flurry of solar energetic particles. But another kind of storm has puzzled scientists for its lack of typical warning signs: They seem to come from nowhere, and scientists call them stealth CMEs. Now, an international team of scientists, led by the Space Sciences Laboratory at University of California, Berkeley, and funded in part by NASA, has developed a model that simulates the evolution of these stealthy solar storms. The scientists relied upon NASA missions STEREO and SOHO for this work, fine-tuning their model until the simulations matched the space-based observations. 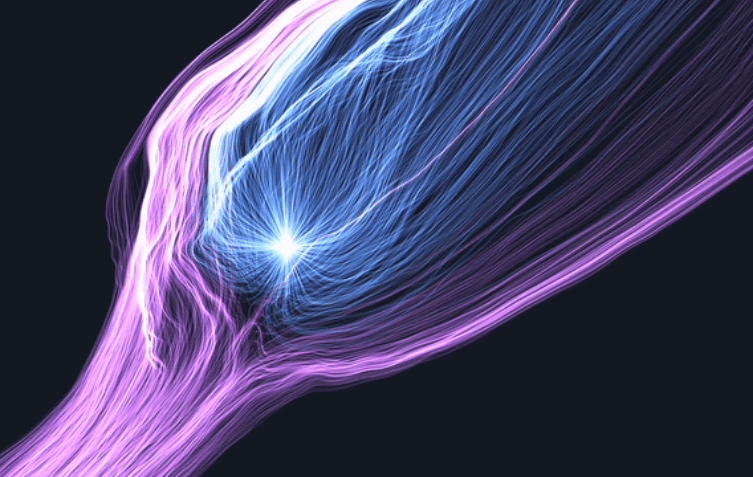 Their work shows how a slow, quiet process can unexpectedly create a twisted mass of magnetic fields on the sun, which then pinches off and speeds out into space — all without any advance warning. Compared to typical CMEs, which erupt from the sun as fast as 1800 miles per second, stealth CMEs move at a rambling gait — between 250 to 435 miles per second. That’s roughly the speed of the more common solar wind, the constant stream of charged particles that flows from the sun. At that speed, stealth CMEs aren’t typically powerful enough to drive major space weather events, but because of their internal magnetic structure they can still cause minor to moderate disturbances to Earth’s magnetic field. The model showed differential rotation causes the sun’s magnetic fields to stretch and spread at different rates. The scientists demonstrated this constant process generates enough energy to form stealth CMEs over the course of roughly two weeks. The sun’s rotation increasingly stresses magnetic field lines over time, eventually warping them into a strained coil of energy. When enough tension builds, the coil expands and pinches off into a massive bubble of twisted magnetic fields — and without warning — the stealth CME quietly leaves the sun. Such computer models can help researchers better understand how the sun affects near-Earth space, and potentially improve our ability to predict space weather, as is done for the nation by the U.S. National Oceanic and Atmospheric Administration. A paper published in the Journal of Geophysical Research on Nov. 5, 2016, summarizes this work. A coronal mass ejection in 2015, seen here by NASA’s Solar Dynamics Observatory, ended up weakening Earth’s magnetic field. On 21 June 2015, a NASA spacecraft called the Solar and Heliospheric Observatory recorded a coronal mass ejection blasting off the sun at roughly 1300 kilometers per second. When the burst reached Earth roughly 40 hours later, its magnetic field was oriented opposite to Earth’s own magnetic field, which caused the fields to be attracted to each other and to interact strongly. “It is like bringing two magnets close together,” says physicist Sunil Gupta of the Tata Institute of Fundamental Research in Mumbai, India, and lead author of the new study. Gupta and his team collected data from a telescope in India that measures the number of charged particles called muons that are created as byproducts when cosmic rays hit Earth’s atmosphere. Looking at data from 22 June 2015, they found a statistically significant spike in the number of muons that day. This result was consistent with a weakening of Earth’s magnetic field that allowed cosmic rays to stream more freely through Earth’s magnetnosphere and into the atmosphere without being deflected. “The weakening of Earth’s magnetic field opens up floodgates for low-energy solar plasma to pour into the atmosphere,” says Gupta, whose team reports its findings this month in Physical Review Letters. In addition to the constant emission of warmth and light, our sun sends out occasional bursts of solar radiation that propel high-energy particles toward Earth. These solar energetic particles, or SEPs, can impact astronauts or satellites. To fully understand these particles, scientists must look to their source: the bursts of solar radiation. But scientists aren’t exactly sure which of the two main features of solar eruptions –narrow solar flares or wide coronal mass ejections – causes the SEPs during different bursts. Scientists try to distinguish between the two possibilities by using observations, and computer models based on those observations, to map out where the particles could be found as they spread out and traveled away from the sun. NASA missions STEREO and SOHO collect the data upon which these models are built. Sometimes, these solar observatories saw SEPs on the opposite side of the sun than where the eruption took place. What kind of explosion on the sun could send the particles so far they ended up behind where they started? Now a new model has been developed by an international team of scientists, led by the University of Central Lancashire and funded in part by NASA. The new model shows how particles could travel to the back of the sun no matter what type of event first propelled them. Previous models assumed the particles mainly follow the average of magnetic field lines in space on their way from the sun to Earth, and slowly spread across the average over time. The average field line forms a steady path following a distinct spiral because of the sun’s rotation. But the new model takes into consideration that magnetic fields lines can wander – a result of turbulence in solar material as it travels away from the sun. With this added information, models now show SEPs spiraling out much wider and farther than previous models predicted – explaining how SEPs find their way to even the far side of the sun. Understanding the nature of SEP distribution helps scientists as they continue to map out the origins of these high-energy particles. A paper published in Astronomy and Astrophysics on June 6, 2016, summarizes the research, a result of collaboration between the University of Central Lancashire, Université Libre de Bruxelles, University of Waikato and Stanford University. An elongated solar filament that extended almost half the sun’s visible hemisphere erupted into space on April 28-29, 2015, in a large burst of bright plasma. Filaments are unstable strands of solar material suspended above the sun by magnetic forces. Solar astronomers around the world had their eyes on this unusually large filament and kept track as it erupted. Both of the coronagraph instruments on the joint ESA/NASA Solar and Heliospheric Observatory, or SOHO, show the coronal mass ejection associated with the eruption. 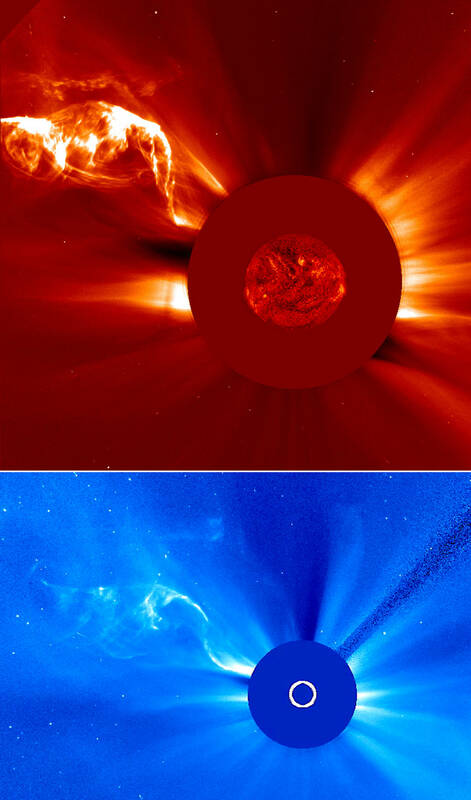 The top image was taken by SOHO’s LASCO C2 coronagraph and the bottom by LASCO C3. LASCO, which stands for Large Angle Spectrometric Coronagraph [ on board SOHO], is able to take images of the solar corona by blocking the light coming directly from the Sun with an occulter disk, creating an artificial eclipse within the instrument itself. C2 images show the inner solar corona up to 8.4 million kilometers (5.25 million miles) away from the Sun. C3 images have a larger field of view: They encompass 32 diameters of the Sun. To put this in perspective, the diameter of the images is 45 million kilometers (about 30 million miles) at the distance of the Sun, or half of the diameter of the orbit of Mercury. The white circle in the center of the round disk represents the size of the sun, which is being blocked by the telescope in order to see the fainter material around it.